Learn at your own pace but still get all the advantages of 30+ years of healthcare value analysis expertise. Select from over 25 on demand programs. The most important aspect of value analysis that is becoming clear is the need to address clinical supply utilization. Learn how you can integrate clinical supply utilization into your value analysis program today. Have a specific training program envisioned in your mind? 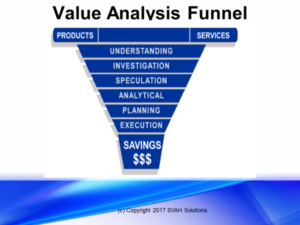 Let SVAH provide all the the necessary customized value analysis training for your value analysis teams via in-person, webinar or on demand. Why Value Analysis Training is More Important Than Ever Before! It's a fact, value analysis is not as easy as it looks. Once you have formed your team structure and built your agenda's you then have to deal with the reality of finding savings and quality improvement with clinicians, department heads and managers who don't want to change. How does a new or even an experienced value analysis professional gain the buy-in to their customers and stakeholders to find the right products that meet their requirements at a lower cost with equal quality. Plus have them accept the process and work with you throughout to gain the big picture goals your management now expects.